4-1/4" OD x 4" ID x 1/8" Wall Tenite Butyrate Tubing | U.S. Plastic Corp.
Excelon CAB (Clear Butyrate Tubing) combines optical clarity and scuff and impact resistance with ease of fabrication. It can be easily cut, bonded with cement and printed and is UL rated. 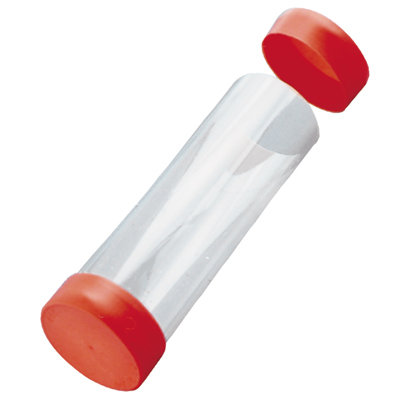 Excelon CAB is ideally suited for plastic packaging and tubing, especially for scientific products. The exceptional permanence and dimensional stability of Excelon CAB make it ideal for thin-walled applications where superior toughness, rigidity and durability are required. Because of its low water absorption characteristics, Excelon CAB exhibits minimal dimensional change in environments of varying humidity. Can withstand Gamma and gas sterilization. Working temperature -40°F to 180°F. Caps sold separately. Sold in 8' lengths.